It all started when Viv told me he wouldn't be around on my birthday because he had a tradeshow to attend in Las Vegas at the same time. I was disappointed but it was not the first time he had been away on my birthday so I didn't take it too badly, unaware of the plans brewing in that head of his. One day he just asked me to apply for a week's leave a week after my birthday. "Because we're finally doing that road trip we had always wanted to." Oh wow. Yes, we had always wanted to do a trip along the west coast of the US, but I had not expected it to be planned this way. Turns out Viv wanted to make up for being absent on my birthday and had applied for a week's leave after his work in Vegas got over. The plan was for me to fly from Singapore to Los Angeles and he would take a flight from Las Vegas and join me there. I still can't get over the 15-hour time difference. 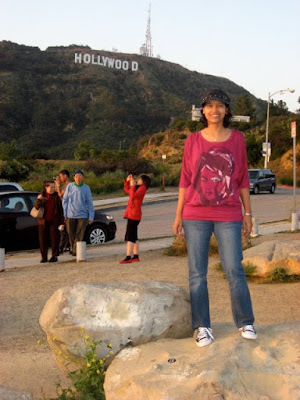 After taking a 20-hour flight on the morning of 16 April, I landed in Los Angeles on... the morning of 16 April! My flight was quite eventful as some of you may have read here. We met at the LA airport, and true to the romantic spirit of long-lost lovers, I ran towards him in slow motion and asked him, "Dude!! Was this (see picture below) the "tradeshow" you were at??? Huh huh huh????" Jokes aside, we made our way in a shuttle bus to pick up our rental car. After the paperwork was done, we were asked to proceed to the garage and pick up any car from "section 7". When we reached "section 7", there were some eight cars parked there. Unfortunately, all of them were the same (PT cruiser). So Viv had to exercise the expert strategy I generally use to differentiate between cars. "Which colour do you like?" He asked. "Erm... Should we take that instead?" But then wisdom struck him and he realised that if he continued, it would be evening by the time we left the place. So we entered his cousin's address in Burbank into the GPS and drove off. The weather was fantastic, and Viv was totally enjoying himself driving on the wide roads though I was really marvelling at how he was managing to drive in the US when everything was, you know, "the other way"! Soon, we reached his cousin's place. I had had a lot of food in the plane, but Viv hadn't and we were really amazed at the home-cooked food his cousin had made for us! It was so yummy I was giving Viv "Kuchh seekho!" looks. After lunch, we took a nap. Viv was okay, but I was terribly jet-lagged so the nap really helped. 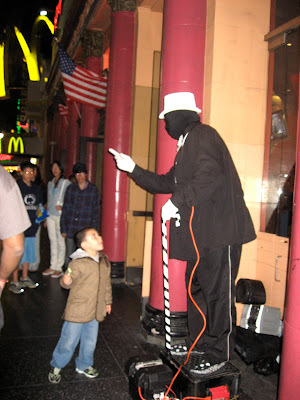 In the evening, his cousin showed us around the area on our way to see the Hollywood sign. Burbank is about 12 miles north of Downtown Los Angeles. It is also known as the "Media Capital of the World," as many media companies are headquartered or have significant production facilities there, including Warner Bros., NBC, The Walt Disney Company, Cartoon Network, and PBS. We saw many of them on the way. The sun had started setting and the weather was getting cooler. 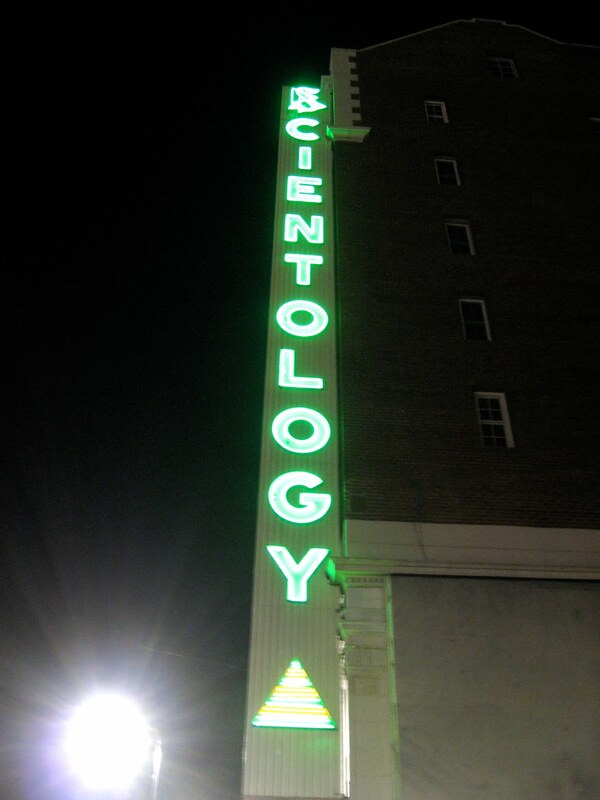 We saw many cars driving up for a look at the famous sign. Now for some history about the sign itself. The sign was first erected in 1923 and originally read "HOLLYWOODLAND". It was meant to advertise the name of a new housing development in the hills above the Hollywood district of Los Angeles. Each of the 13 letters was 30 feet wide and 50 feet high, and was studded with some 4000 light bulbs. The sign, made with wood and sheet metal, was meant to be taken down in a year or so, but after the rise of American cinema in Los Angeles it became an internationally recognised symbol, and was left there. I also found some interesting trivia about the letter "H" in the sign. In 1932, a Broadway actress jumped to her death from the letter, and in the 40s, the sign's caretaker drove through the sign while drunk, and destroyed it. That sure was not a lucky letter! Over the years, the sign deteriorated considerably, and a campaign was started to restore it. A total of US$250,000, collected from donations, were used to sponsor replacement letters made of steel this time, so that the sign could last for many years. These letters were 45 feet tall and 31-39 feet wide. This new sign was unveiled on Hollywood's 75th anniversary, 14 November 1978. In 2005, the letters were again repainted white. We then proceeded to see the Kodak Theatre, home to the Oscars and American Idol. 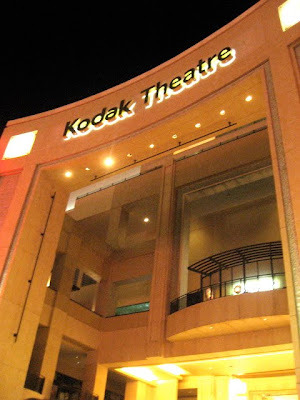 Around the Kodak Theatre, you see many people dressed as movie characters and walking around taking photos with tourists. One of them was posing behind us, without us knowing! As you can see from my grin, he was not at all scary even when he had a knife to my throat. And Darth Vader himself, going off to take a Starbucks break! We took a walk around Hollywood Boulevard next. It had gotten quite chilly and I was really thankful for my jacket. 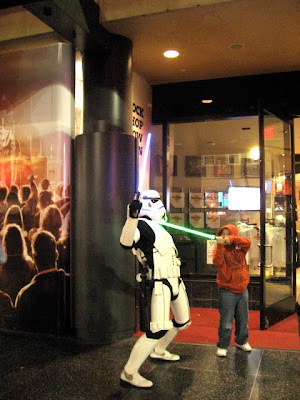 We didn't go inside the Madam Tussaud's wax museum. Viv wasn't keen, and I had already seen it in London and Singapore. 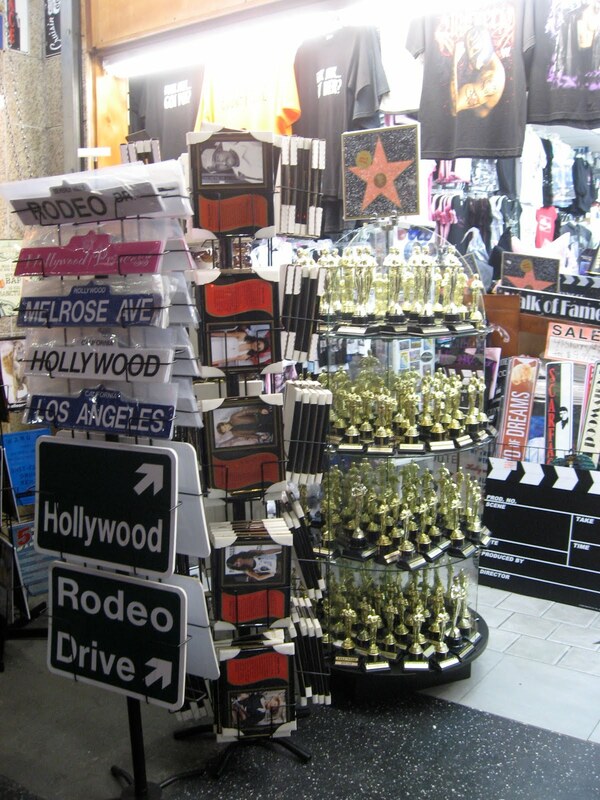 Oscar statuettes you could buy as souvenirs, saying things like "World's best dad", etc. Ripley's Believe it or not. I liked how they called it an 'odditorium'. 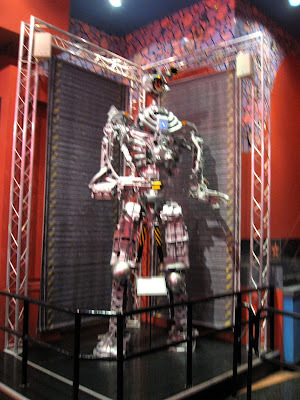 This automated robot is made fully of various automobile parts! After this, we drove around Beverly Hills to look at the homes of very rich people. Finally, the deep sense of poverty and hunger struck us. We went for dinner to El Torito, as I was dying to have Mexican food. The food was totally awesome! We ended the night by taking some awesome pictures from a hilltop at Glendale. And so ended Day 1. Coming up next are Griffith Observatory and Santa Monica beach. Stay tuned! teek he, technofun ab toh gold mila! :) silver!! "(Yes, I am very happy he doesn't have that tendency with women!)" And btw, I loved the pink face tee you wore when you went to see the HOLLYWOOD sign...where did you pick it up from?